I’ve put up a lot of book reviews this week. 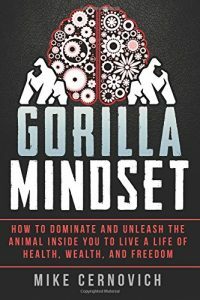 In Wednesday’s review of Gorilla Mindset I mentioned that it’s not so much that I’ve read a lot recently as that I’ve finished a lot all at once. The Unexpected Enlightenment of Rachel Griffin is the exception. I started the book earlier this week and finished it very quickly. It was a very fast read for two reasons. First, it’s a young adult book. 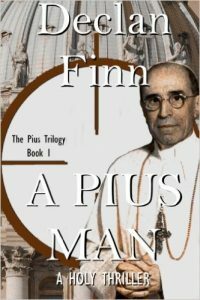 The language is simple, the story is not overly complex, and it’s an easy read. Second, the book is thoroughly engaging. Once I started it, I didn’t want to put it down. I’m not a particular fan of young adult books. I have, of course, read my fair share of them – probably hundreds of them. I also graduated past them pretty quickly: I read Tolkien in the fourth grade and Asimov, Herbert, Clancy, and Crichton only a year or two later. Of course, I still devoured a ton of YA books at that age. But even then it wasn’t because I preferred the genre. I simply read whatever I could get my hands on out of sheer boredom. My young adult reading since high school mostly consists of the Harry Potter series. So you can imagine that I didn’t particularly seek out this series. Furthermore, while I have been interested in reading Ms. Lamplighter’s works for some time, I’ve also eyed them with some trepidation. You see, I know her better as Mrs. John C. Wright, and her husband may well be my favorite still-living-and-writing author. To be fair, I would never expect any author to live up to that. How could they? Yet it still puts an unfair burden on Ms. Lamplighter. Thankfully, I can report that this work is excellent. The setting and the world borrow very liberally from Harry Potter. If you’re a fan of J.K. Rowling’s, you will enjoy this book. 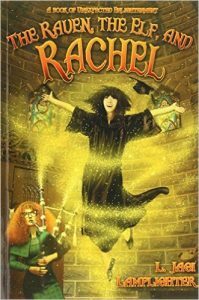 And as you might expect from knowing that and seeing the cover, the book can be somewhat fairly described as “Harry Potter with a girl as the main character.” Some people will be interested in the book purely for that, and that’s fine. If that sounds great to you, skip the rest of my review and just go read the book. It won’t disappoint you. But the great thing is that the book very quickly establishes itself as far more than that. 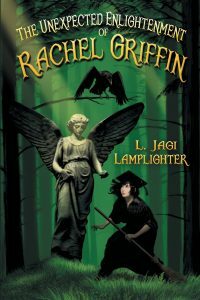 Not that I’m implying that it’s better than Harry Potter – it isn’t, if I may risk offending Ms. Lamplighter, although it is definitely worthy of Harry Potter. But it’s definitely not just a Harry Potter ripoff that happens to be about a girl. The story involves something akin to our modern world, with a hidden world of magic thriving within it. The witches and wizards of this world send their children to magical boarding schools. Evil wizards attack one of these schools. Sound familiar? The similarities pretty much end there, however. The story is radically different from any of Ms. Rowling’s. The characters are very different. A danger of writing about thirteen year old girls is that so many of them are just annoying. Rachel, on the other hand, is quite endearing. She’s earnest without being a brown noser, bright without becoming a know-it-all, and feisty without becoming obnoxious. Her friends are just as interesting. 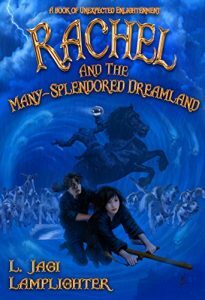 I particularly enjoyed Sigfried, the orphan who wants nothing more than to be a valiant knight, and Gaius, the man apart from the group. Yet all of the characters are fun and enjoyable. I give the book four stars out of five for adults, but I’d give it five out of five if recommending it to a younger reader (which is, in fact, it’s target audience). My oldest son is not yet reading well enough for a book this complex, but in a few years he will be. When he reaches that point, this book will be on his reading list right next to the Narnia and Harry Potter books. If you loved either, but especially if you love the latter, you should take a look at this book. 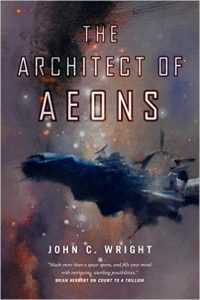 It has been more than two months now since Mr. John C. Wright surprised me with the delivery of a review copy of one of his latest novels, The Architect of Aeons. Yes, I have had the extreme good fortune to receive not one but two unsolicited works from Mr. Wright now. That is why I must begin this review with a sincere apology to the book’s author. 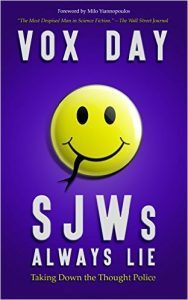 It has taken me far too long to finish reading this book and get this review online. In my defense, they have been two insanely busy months. We have a new baby in the house (my youngest turns three months old today). In that time, I’ve also planned and hosted a major martial arts seminar, attended a Judo tournament, put editing work into Silver Empire‘s first full length novel (look for announcements on that very soon! ), had to find a new cover artist, plugged away at two short stories for our next anthology (more on that project soon as well), had to plow through some submissions for the same anthology (some not so great, some… very, very excellent), had a major software delivery do at work, made a trip to visit my ailing grandmother in Washington, D.C., and, of course, have had all of the normal duties of adult life on top of all that. A week or so ago, however, I finally hit a nice point. My editing notes had been sent off to Susan, I’d passed the halfway point on my own first novel, seminars and tournaments were done, and I finally had a moment to relax. If it assuages Mr. Wright’s ego in any way, this book was my reward for finishing all of the important things in my life – and I used this book as motivation, telling myself I could not read it until I finished those things. Then, of course, it still took me far longer to actually read it than it should have. Now that I have finally finished it, I must say that this book is an intriguing read. I have to admit that I struggled a bit with the first half of the book. It’s a difficulty of the format that I’ve had with much of this series. Mr. Wright has adopted the most difficult task of telling the story mostly in “catch up” sessions. Large periods of time elapse with the main character, Menelaus Montrose, either in time dilation from space travel or, more commonly, in suspended animation. Each time he re-enters “normal time” there are large bits of dialogue catching him up on the history (sometimes millennia worth) that happened while he was away. I can think of no better way to tell a story such as this. And it’s a testament to Mr. Wright’s amazing skill as an author that he makes it work at all. Nevertheless, it can at times be a difficult way to read a story. The second half of the book, however, really shines. Indeed, I zipped through that part of the book easily. And it is here that Mr. Wright once more touches on the issues that have really defined the series. How does a normal(ish) human survive in a world that is dominated by posthuman intelligences far superior to his? Not just superior, but orders of magnitude superior? There are moments in the second half that are pure gold: the duel between Montrose and an entire planet, the Foxes, Montrose forcing a galactic level superintelligence into a deal on his terms. 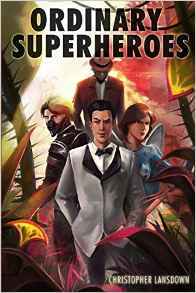 The work also continues to explore other issues that have been hallmarks of Mr. Wright’s work dating back to The Golden Age trilogy. What is the true nature of identity? If my mind is uploaded in full into another host, which one is truly me? What about when those minds diverge? What if one of them sees its intelligence amplified – or reduced? These questions of identity and intelligence are what continue to make this series fascinating. And despite the somewhat sluggish nature of the book’s beginning, this is why Architect of Aeons still merits four out of five stars. A strong showing from Mr. Wright, and I continue to look forward to the rest of this series.